There are some places that you visit and you know straight away that you have come home. 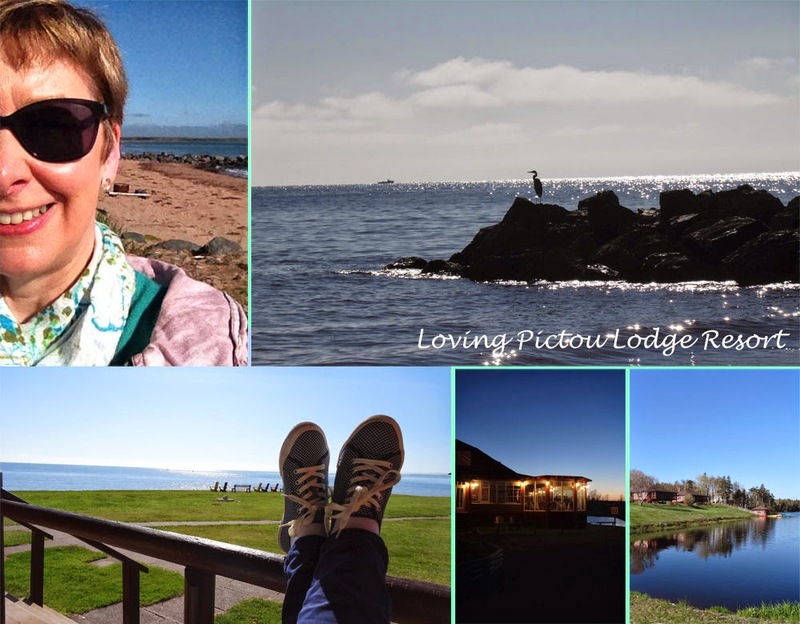 My drive to Pictou Lodge was uneventful and I started to really enjoy driving the Jeep, a slight scare as I approached a round-about (oh my goodness, I'm going to have to drive round it the 'wrong way') but I survived and arrived excitedly at Pictou Lodge to blue skies and the ocean. 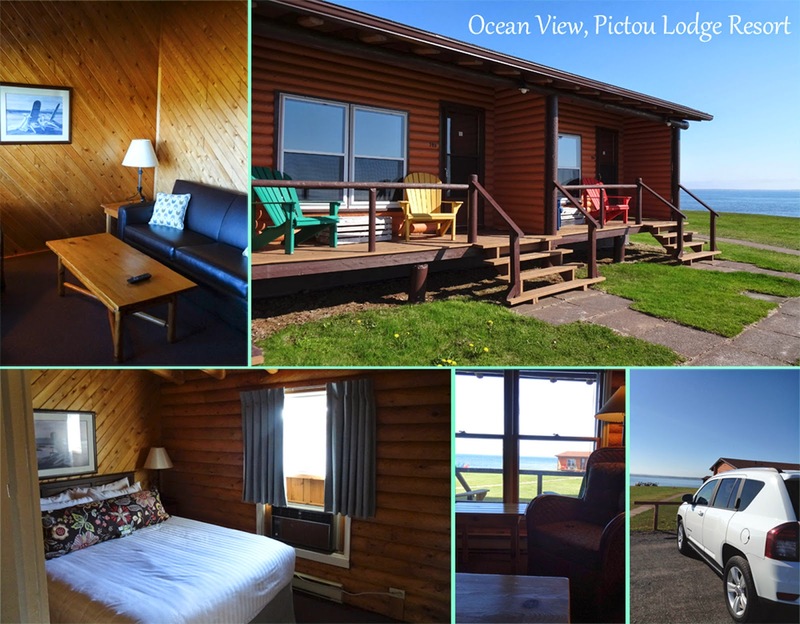 I checked in and headed over to my cabin in Cedar Court or 'Ocean View', I later discovered that this cabin was one that Condalisa Rice had stayed in at a summit held at the Lodge, nothing but the best for me! 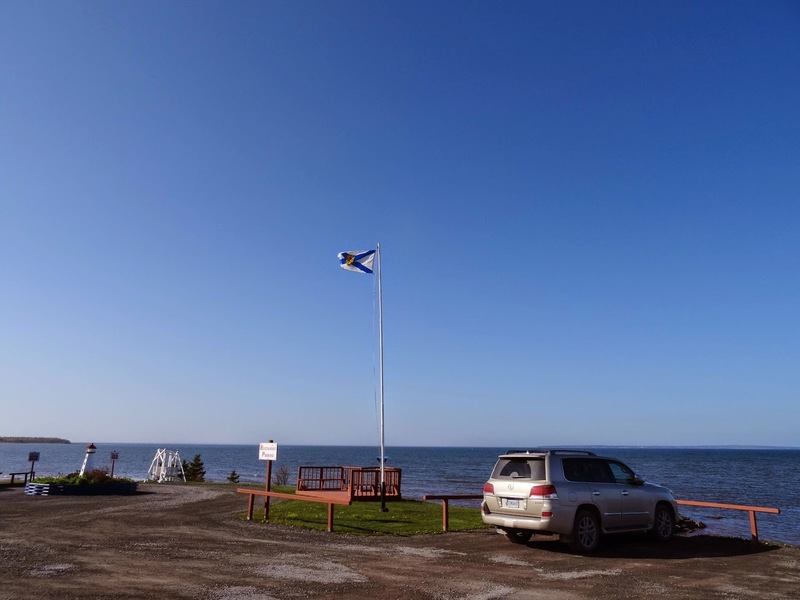 These wooden cabins were well appointed with a comfortable bedroom and living room complete with coffee machine, fridge and a view out over the ocean, oh and there is my Jeep again (love my Jeep). There's an ice machine down at the bottom of the row of cottages too so you can fill your ice bucket for chilled drinks. 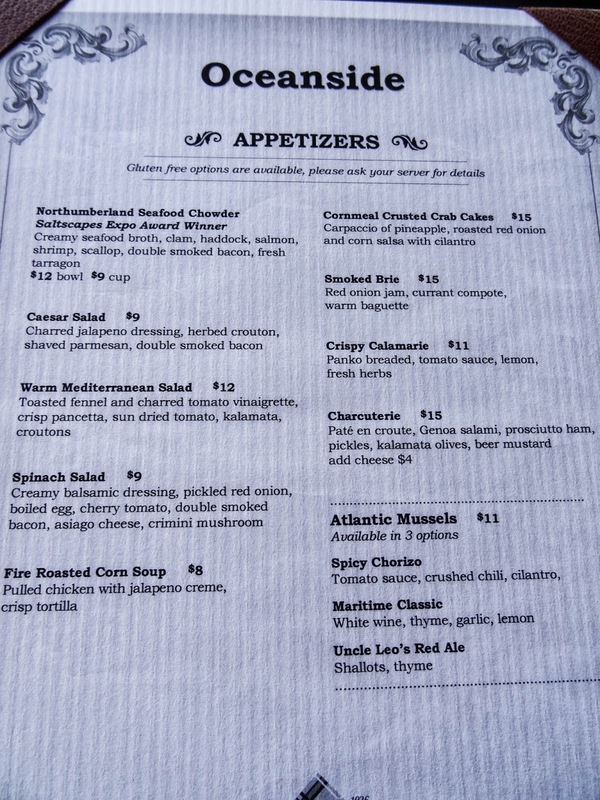 If you've read my previous post, you will realise that I had only just stopped eating on my Food Tour of downtown Halifax at about 3pm then drove straight up to Pictou, and dinner was booked for 7.00pm. 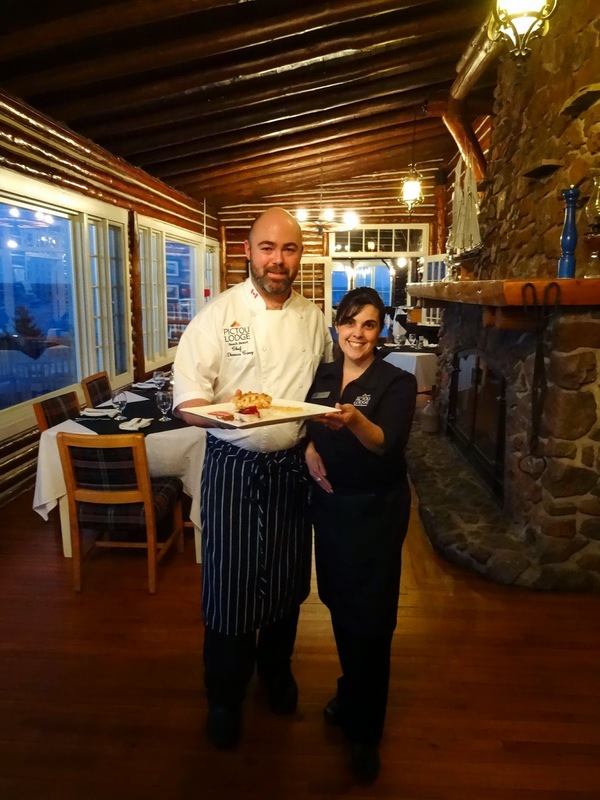 After freshening up, I headed to the main Lodge where I was welcomed into the dining room by Jill, my server. Jill has Scottish ancestory, being a Johnston by birth so we had plenty to talk about. She was also an outstanding server, friendly, knowledgeable and interested, she looked after me very well indeed. I was offered the opportunity to choose from the menu or to have the chef prepare me a special tasting menu, well what's a girl to do? Chef Thomas Carey came to speak to me to ask how hungry I was, of course I was not particularly hungry as I had been eating all afternoon, however he assured me he would 'get me through to dessert'. Jill then suggested that she match the wines to the different courses, I have never felt so spoiled. Pictou Lodge is approved by Taste of Nova Scotia their menu is designed around fresh local ingredients as required by Taste of Nova Scotia association features seafood fresh off the boat from nearby waters, seasonal organic vegetables from a nearby farm, and local strawberries, blueberries, maple syrup and honey. 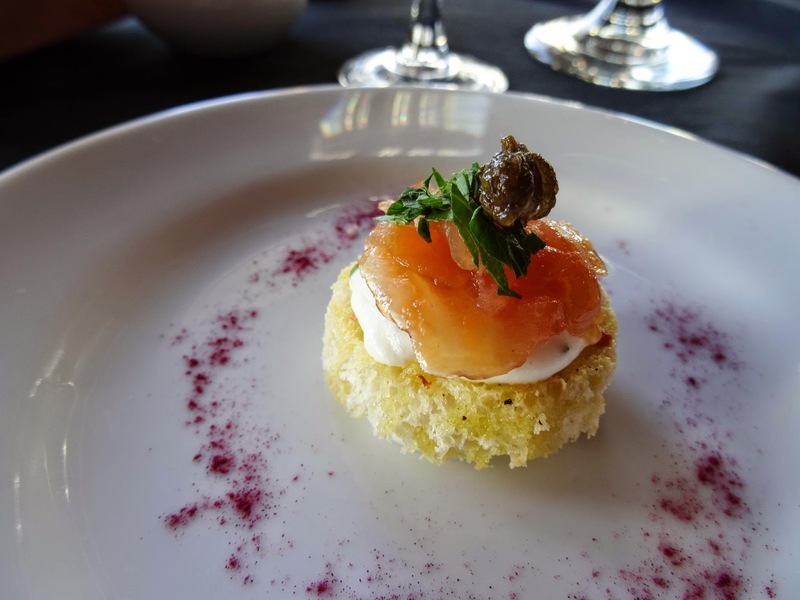 While the chef started on the dishes for the tasting menu I was served with the smoked salmon Amuse Bouche in the first picture of this post. Alongside this I received a brown paper lunch sack containing home made biscuits and a small pot of molasses butter. I've never tasted anything quite like that molasses butter, I had to restrain myself from eating them all as I knew I had more treats in store and had to pace myself. 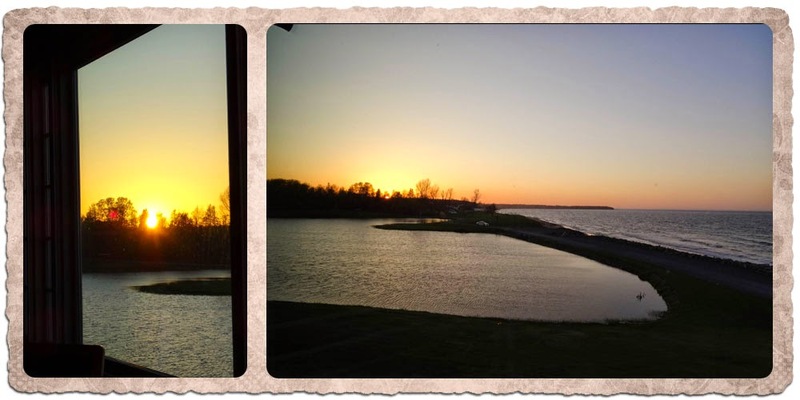 Let me tell you a little about the dining rooms at Pictou Lodge Resort. 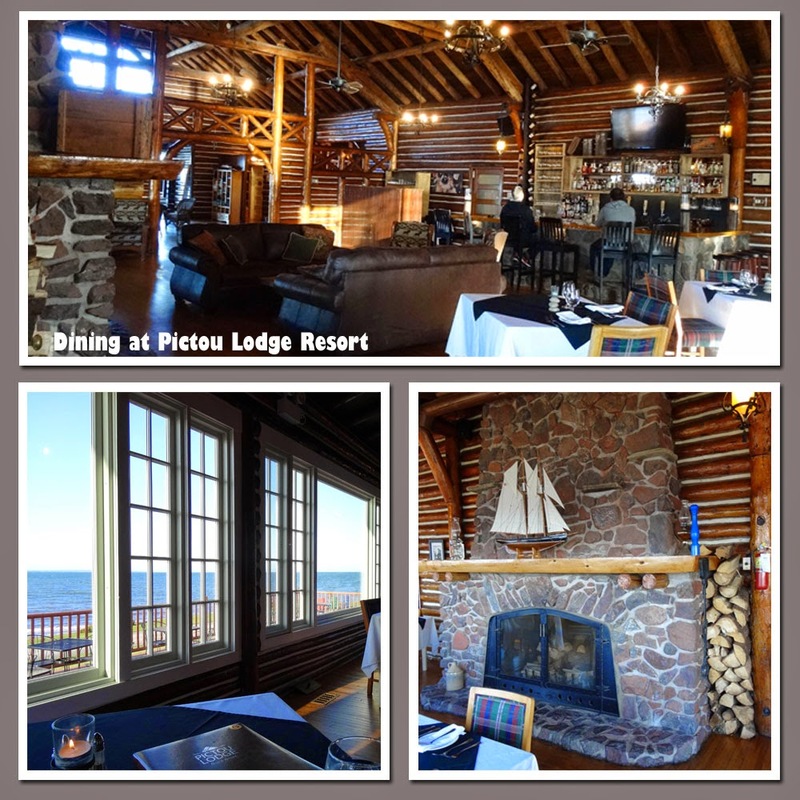 The top picture shows the bar and lounge area where you can also dine, you can see the full range of menus for Pictou Lodge at Oceanside Dining. The bottom left photo is taken from my dining table, every table has a superb view of the ocean, turn around and behind you is the massive fireplace, how superb must that be in the winter? This is the Warm Mediterranean Salad, isn't it pretty? 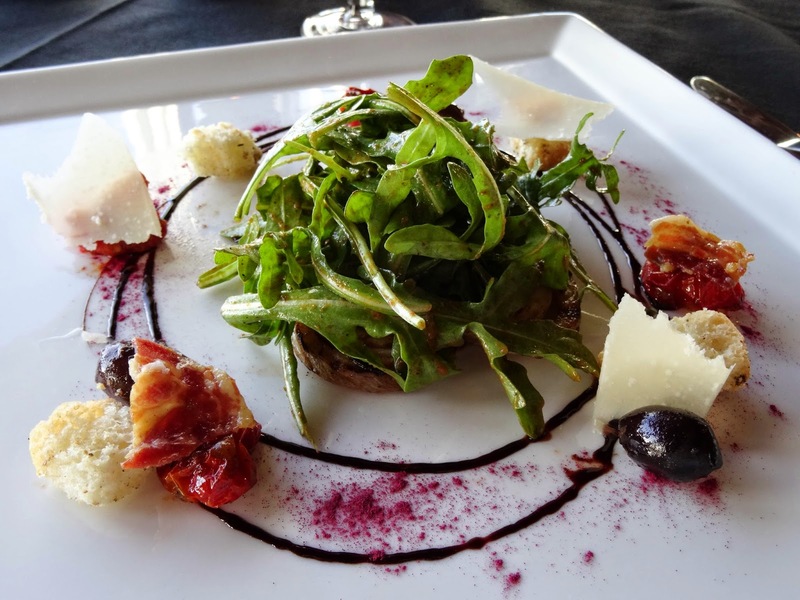 A really nicely balanced salad of sweet sundried tomatoes, toasted fennel, crisp pancetta and salty parmesan and kalamata olives, the 'arugula' (rocket) salad was dressed in a glorious balsamic dressing. I was served a fresh white Nova Scotia wine which was easy to drink, I didn't get a note of the wines but I suspect the white was Tidal Bay as I tasted that wine quite often in the days to come (oh dear that sounds bad!) it was easy drinking with only 11- 12% alcohol. While sipping my wine and enjoying my salad, I had a panoramic view of the beach, the ocean and these sea birds. I recognised the one on the left as a Heron and I think that is a Sea Eagle on the right. Dining alone is not always the most fun experience but I can honestly say there was so much to look at that I didn't feel awkward at all. 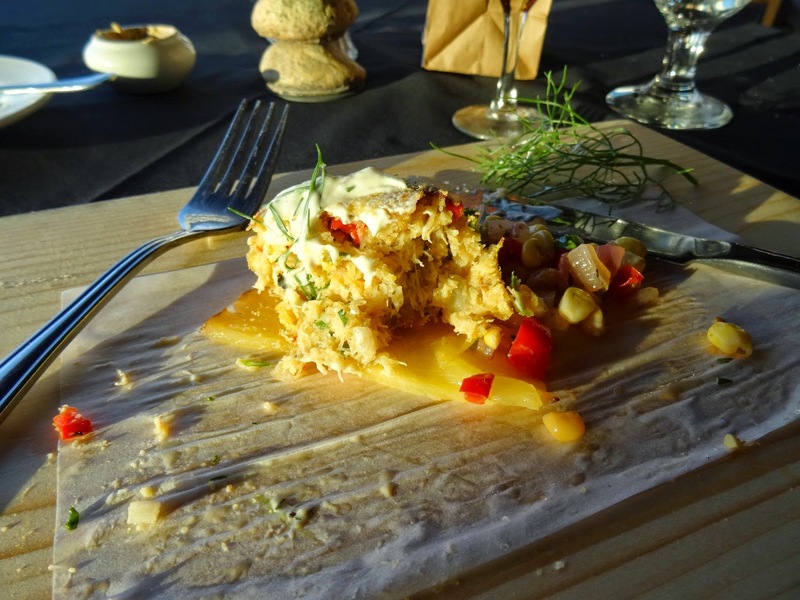 And so to the Crab Cake on Carpaccio of Pineapple with Roasted Red Onion and Corn Salsa. 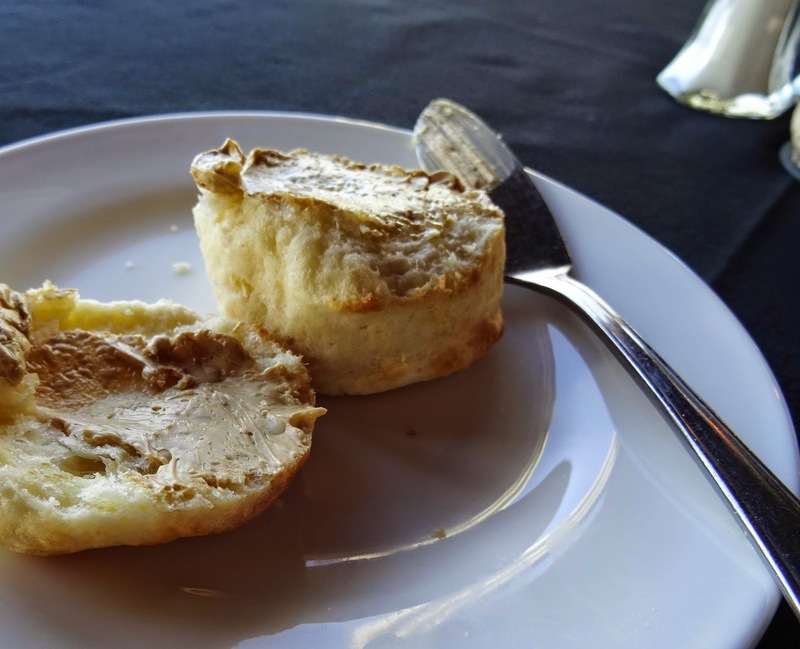 By the end of the trip I was a bit of an expert on the crab cakes of Nova Scotia, this one had a crisp outside with a soft textured inside, it tasted sweet with a hint of chilli heat, cooled by the sour cream dressing. 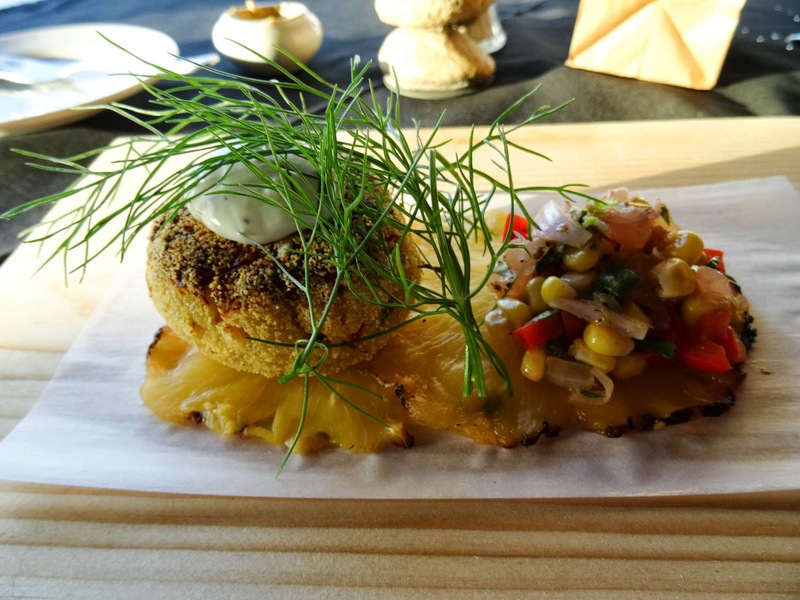 The soft crab cake of offset well by the crunchy corn salsa and the pineapple added another layer of taste and texture. I would have loved to finish every course, it went against the grain to leave any of these dishes, but I had to leave a little. I didn't drink all the wine either but did enjoy the local 'champagne' style sparkling wine which had a lovely honeyed taste. 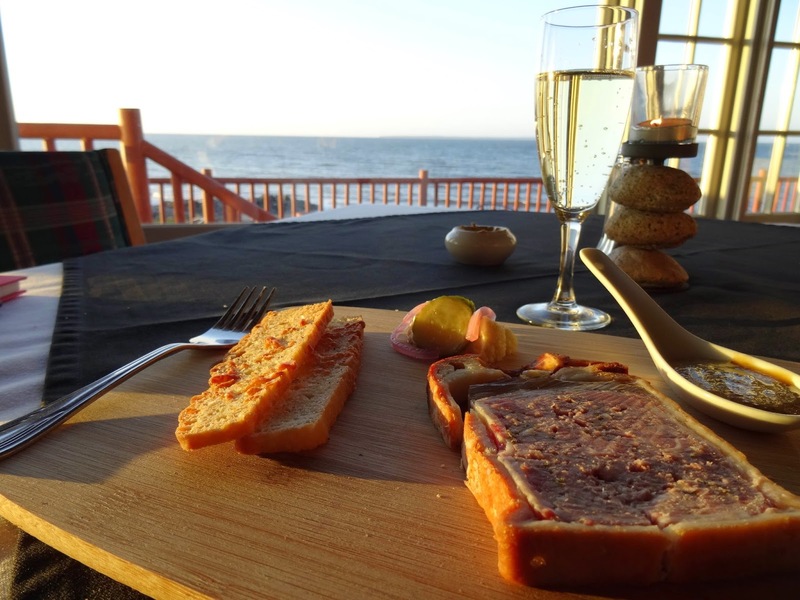 My glass was topped up with bubbles and I was served with a plank of Chicken and Pork Pate en Croute with homemade pickle, mustard and parmesan croute. Imagine the very best picnic pie you could ever taste, well this was it! The pate was soft with a delicious pastry crust, the vegetables were lightly pickled and added a crunch to the dish, as did the parmesan croutes, so tasty. The honeyed mustard made a good alternative condiment to the pickles and as you can see the sun had started to set and was casting a honeyed glow to all my photographs, just part of the Oceanside Dining experience. 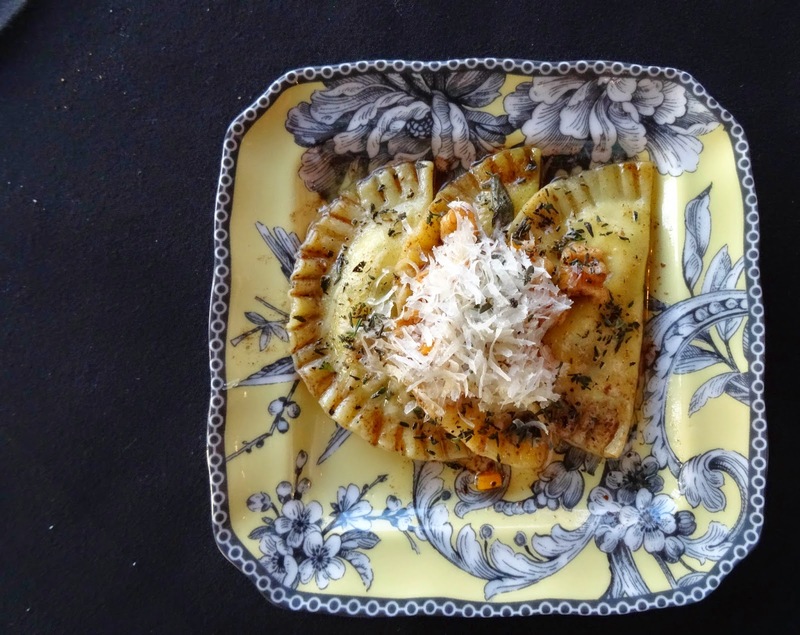 This pretty little plate held parcels of hand made pasta, firmly al dente, with a creamy soft spinach and ricotta filling covered in a rich brown butter sauce with crunchy walnut pieces and tiny cubes of butternut squash, sprinkled with parmesan. I could feel the butter sauce coating my lips. It was served with a glass of fruity, red Cabernet Sauvignon wine, which was the perfect foil for the rich buttery and creamy dish. Just when I thought I could eat no more, out came this dish of Northumberland Lamb Risotto, picked lamb shank and mushroom risotto with mint and peas. The Northumberland coast is renowned for it's lamb in Nova Scotia. The lamb is raised close to the shore, eating the shoreline plants and taking on some of the flavours. The risotto was incredibly rich, probably a little overseasoned for me, but still really delicious pieces of lamb fell apart, the rice was creamy, the fresh mint garnish helped to cut through the richness. I described it in my notes as 'a really grown-up dish'. 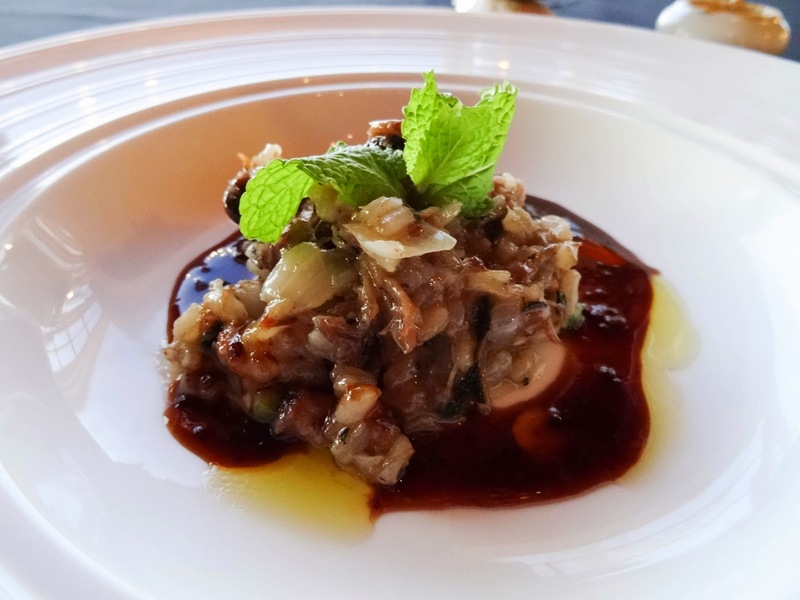 With this dish I was served a wine called Baco Noir which I can highly recommend, it had depth of flavour and you could taste and feel the tannin which was needed with such a rich dish. Remember I said at the beginning that Chef Thomas told me he would get me through to dessert? Well this is the dessert plate and here I am! The two desserts are Deep Fried Apple Pie with Salted Caramel Sauce and Blueberry Cheesecake. The cheesecake was rich , not a light mousse but a proper cheesecake, however there was no base, the chocolate crumb was served at the side, the blueberry topping was fresh and fruity. 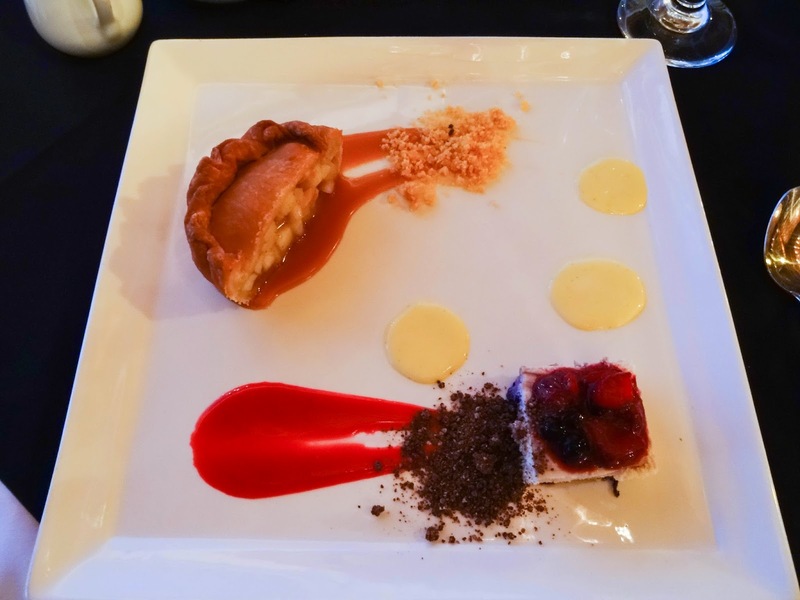 I was hugely surprised by the deep fried apple pie, it didn't look or sound appealing to me at all, especially as I was so full, however I would really recommend it, the pie crust was crisp and chewy, the apples inside still had a bit of bite and were nicely sharp, a great contrast to the delicious salted caramel sauce. I'd like to thank Chef Thomas and Server Jill for their care and attention, this was an exceptional meal in an outstanding setting and if you go to Nova Scotia, I would urge you to visit Pictou Lodge Resort for dinner and, if you can, you should also stay, I've added a montage of my wanderings the next morning before I set off on the next part of my adventure. Sounds fabulous, Janice! I'd love to visit one day! Janice you were very spoiled indeed - what a fabulous location venue AND meal. Really enjoying reading about your adventures, but just realised I missed one, so off to read that now. No, got that wrong, I have read all of them. Thanks Fiona, it was a great experience. Thanks Christina, it is a beautiful place, I'd love to go back. Thank you, it was amazing and I was fortunate to get such good weather. Yes, I was spoiled, glad you are enjoying reading about it. how wonderful. I have enjoyed seeing your pictures as you travelled through canada. That food looks good and then some. It is fun traveling around Canada through your eyes and food.